I tend to overwhelm myself with several things at once and that's why I feel like I started all of this craziness at the most inconvenient time of my life. I have a full time job processing files for a real estate company. That in itself is enough for one person. I also started an interior design business and run that out of my home. I design the interiors of new construction homes for a building company. Interior design is extremely hands on (which I have recently learned) and it requires you to be on site, shopping for materials, and keeping in good communication with the contractor so things go right. I learned all of this the hard way when there was some miscommunication with one of the homes. So because I work a 9-5 Monday through Friday, most of that all happens on the weekends. And to top it off, I run this blog and try to post twice a week. I also have a family, and a house and animals and Grandparents and Parents that I make time for and somehow it all works, and I love every second of it, but it gets crazy. I feel like this is such a weird post to go on a rant about but it all goes together I promise. With all of that said, it's so hard to get my family to eat healthy. It is so easy for me to send my husband out for fast food (his favorite I hate it) or put a frozen pizza in the oven. Don't get me wrong, I love me some frozen pizza but it's not healthy. I try to get the best kind I can find but in all reality, I need to feed my family better. My son and my husband are snackers. They love their cookies, and easy to grab snacks before and after a meal. I noticed this and thought I'd put together a place where they can go for the treats. My husband loves chocolate chip cookies more than a pregnant woman, so I found a very easy and very healthy recipe to make my own. As you can tell here, they're running low. They're delicious! I'll share that recipe here on the blog someday. I like to keep them around and sometimes when I'm in a hurry in the mornings, I give one to my son for breakfast. When you see the recipe, you'll see why it's totally ok for him to have one for breakfast! My son loves apples and oranges so I always keep a bowl of each out. I also put some of his favorite squeeze apple sauces in a jar for easy access. There's bowls from the Target Dollar Spot for them to easily grab and a stool for my son to get on if he wants to get something himself. After I moved our whole house around, I've been inspired to make our house simple and functional while still being pretty at the same time. This is something that I think will stick around for a long time. It's convenient and looks cute! It's also great for guests. With the bowls already there, it's more welcoming for them to grab a snack while they're over without feeling like they need to ask. 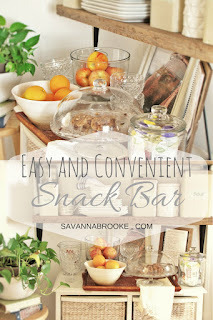 I just love this little snack bar in our kitchen. 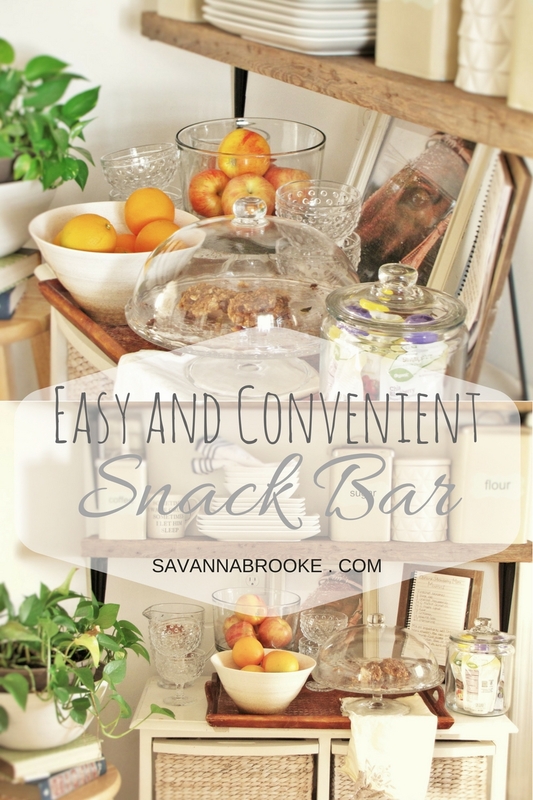 Do you have a snack bar?? If not I hope this inspired you a little bit to make your home more functional, and if you have one or make one I'd love to see it!! Thank you as always for stopping by to see what I'm up to, it's always something crazy! !